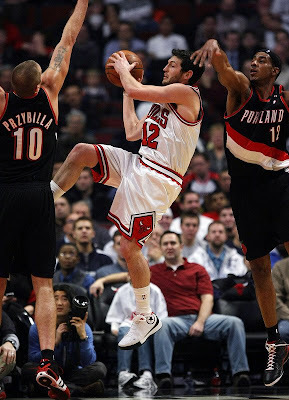 The Converse Blog: Kirk Hinrich returns in the Converse 0100. Finally it happened the other night. I've been waiting since the summer Olympics to see the Converse 0100 on the feet of some NBA players. 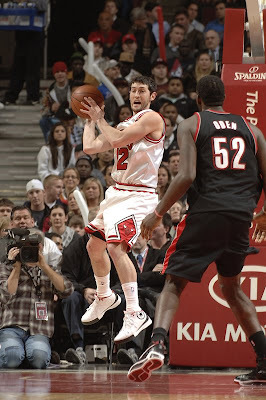 When Kirk Hinrich returned to the Bulls line up the other night he did it in a pair of Converse 0100. Personally this is my favorite Converse shoe to come out in quite awhile. If you haven't tried on a pair of these yet then you're really missing out. Hit up Eastbay, Finishline, or Converse.com for some deeply reduced prices. 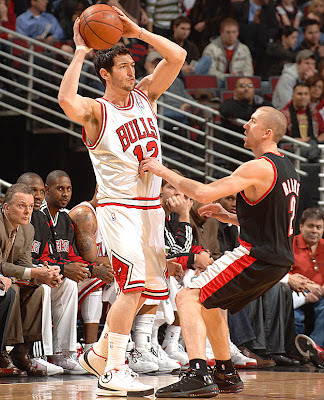 Kirk is rocking a White/Black/Red PE edition of one the cleanest shoes I've ever seen. Now if we can just get everyone else to start wearing these. I especially want to see the Kyle Korver and Alando Tucker colorways. That's about it for today, but while I have you attention let me just say Jodie Meeks. I've heard some Dwyane Wade comparisons, but we'll have to see how the rest of the season goes. i was looking for a pair of black Converse Accelerator 3, and i found some reference of it on your blog a while back. would you happen to know if and where i can still find them? where do i find themmm ??! !